2000AD comic Prog #80 (2nd September 1978) | 'TAIN'T THE MEAT… IT'S THE HUMANITY! 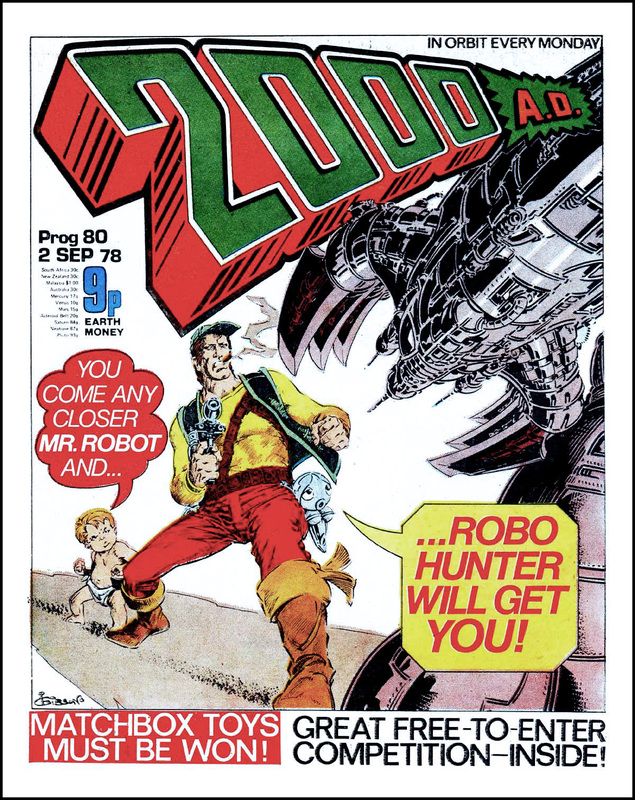 Artist Ian Gibson’s rendition of Sam Slade, Robo-Hunter, graces the cover to Prog #80 of 2000AD, the long-running weekly British anthology science-fiction comic. Cover dated 2nd September 1978 (and priced at 9p Earth money) this was the second cover to feature the Brit-Cit robot bounty-hunter written by Judge Dredd creator John Wagner and illustrated by Gibson. I was a great fan of Robo-Hunter when I read these stories as a kid and for a while the strip was my favourite, even surpassing Dredd in my appreciation. I found the society Slade inhabits – one where robots perform every task imaginable – hugely entertaining and the stories still hold-up 40 years later. Even his cigar is a robot! And I loved Gibsons’ artwork too – his loose and fluid drawing style perfectly suited the comedic nature of the strip and he’s a master at page layout and design. There’s a great sense of depth to his cover for this issue, with the giant robot hand leading the reader’s eye into the cover where a heroic Slade stands ready for action, with Kidd cowering behind him. As with nearly all the early 2000ADs, this issue is a classic. Robo-Hunter kicks off the Prog (issue) with part five of the Verdus storyline. The monster insect strip Ant Wars followed with part 20 the classic Judge Dredd story The Cursed Earth filling the coveted full-colour centre-spread. The twist-in-the-tale series Tharg’s Future-Shocks came next with Dan Dare wrapping up an memorable issue. Also included was the last part of the cut-out a keep Cursed Earth board game, which I never played at the time because I didn’t want to ruin the issue (and still don’t). Right from the off Robo-Hunter proved popular with readers and the strip was a semi-regular fixture in 2000AD comic until the mid-1980’s. It has been revived a few times over the last 20 years or so but for me those new stories paled when compared to the origin run, thanks mainly to Gibson’s terrific artwork. Why Hollywood hasn’t turned the strip into a movie yet is beyond me. Coming soon: another great 2000AD cover by Kevin O’Neill (here).